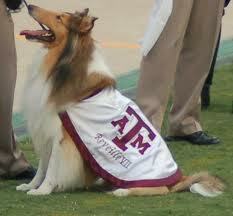 All former mascot collies, named Reveille, have full military burials AND are buried where they can see the football scoreboard at Kyle Field! By Larry Hollis, DVM, M.Ag. There are many things we do with beef calves that can cause stress. And, we know all too well that stress affects performance. Stress can even suppress the immune system and lead to health problems, especially respiratory disease. But, weaning is one procedure that doesn’t have to be a major stressor in the calf’s life. Our industry is rapidly learning that low-stress weaning makes a significant difference in how much calves gain and how well they perform. There are multiple ways to wean. Some are abrupt (hard weaning), others more gradual (soft weaning). Hard weaning methods immediately separate calves from their mothers, including putting unweaned calves on the truck or in a pen or dry lot until they stop bawling. We also hard wean when we sort calves off and move them into a new pasture. Soft weaning methods prevent nursing, but still allow the calf to have contact with the cow. Nose clips and fenceline weaning are the two most common soft weaning techniques. Plastic nose clips, attached to the calf’s nose, have a flap that prevents the calf from getting the cow’s teat in its mouth; some also “stick” the cow so that she moves away when the calf tries to suckle. With fenceline weaning, cows are moved into an adjacent pasture and calves are left in their “home” pasture, allowing them to go nose-to-nose and do everything except nurse. When you look at the various weaning methods, soft weaning methods clearly create less stress for the calf and should be employed whenever feasible and appropriate for the operation. Specifically, research has revealed that fenceline weaning comes closest to replicating the performance of the pre-weaned calves in terms of how much time they spend resting and eating, as well as how much they gain at 2 weeks and at 10 weeks. So, for producers who have the resources to introduce fenceline weaning, I highly recommend it. It’s less stressful than even the nose-clip method, which requires putting calves through a chute twice to insert and remove the clips. To implement fenceline weaning, you do have to make sure you have a calf-proof fence because the calves will, of course, try to get to their mothers. And, you must have adequate pasture space, which may be an issue for some smaller operations. Nevertheless, the advantages of fenceline weaning are clear. Calves are less stressed, have better gains and enjoy better health than those weaned in other ways. Of the producers I know who have tried fenceline weaning, none have gone back to previous methods. Larry Hollis is extension beef veterinarian and professor of beef cattle management and nutrition at Kansas State University.